So my daughter spotted a box of plain, glass ornaments in our ornament bin. I tried to hide them, because our tree is already so overloaded, but she can’t be fooled. She wanted to decorate them. I wanted to decorate them in as easy a way as possible. (It was that kind of day.) 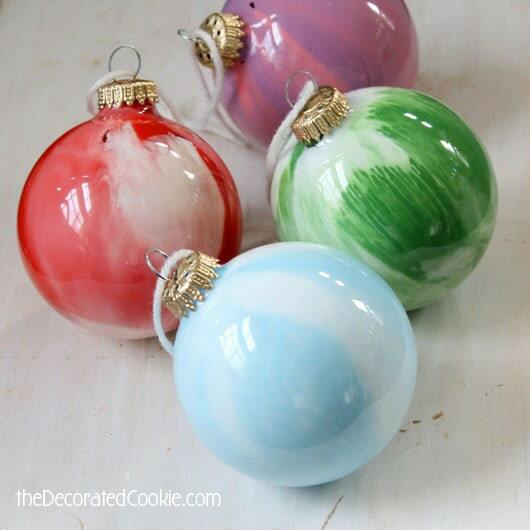 I remember my sister-in-law made paint swirl ornaments years ago, long before the kids were even thoughts in our heads. I remember these ornaments so many years later, because mine is hanging from my tree as I type. 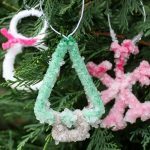 Turns out, swirling paint in ornaments is perfect for kids, except for the part where her paints were too thick so we had to use my craft acrylics. The acrylics worked well, but they aren’t as washable as poster paint, so just be careful with the drips and drops on the finery. *Find the ornaments at the craft store. For the paint, I used acrylics from the craft store, as the consistency was just right. 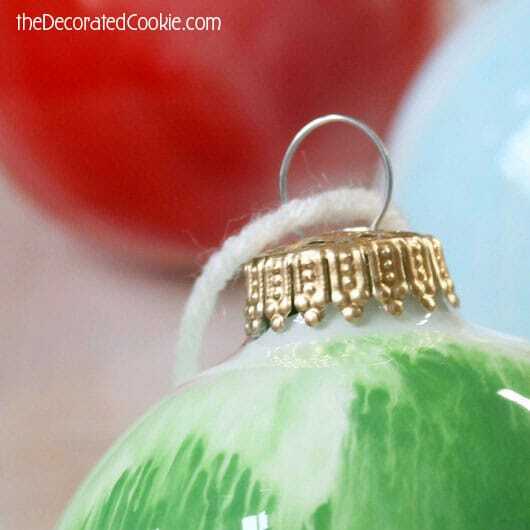 What to do: Take the top off of the ornament. Squirt a couple colors of paint inside and swirl away. I only added about a teaspoon each at first, and then added more paint as needed. 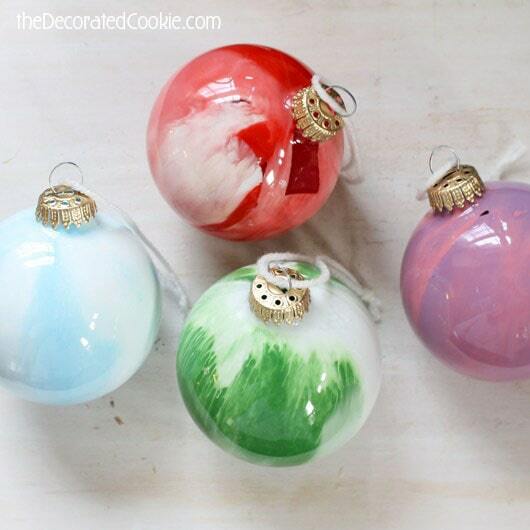 Let the ornaments dry. 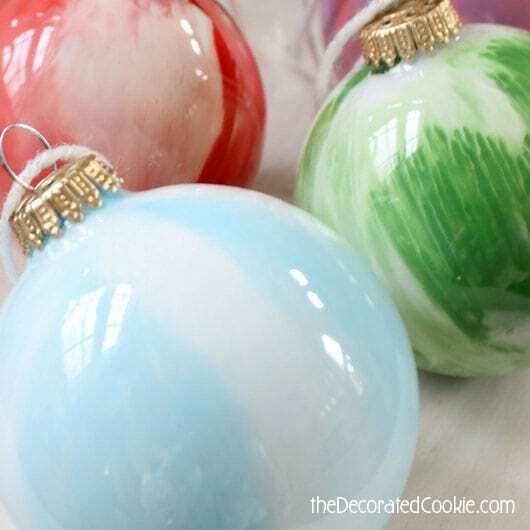 TIP: If you have too much paint in the ornament, overturn it and let it drip out. An empty egg carton works well for thPut the top back on. 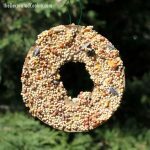 Add yarn, ribbon or a hook to hang. WHAT KIND OF PAINT DO YOU USE THAT YOU CAN SQUIRT? Hi ca king, we just used craft store acrylics. Michaels, Jo-Anns, hobby lobby and AC Moore should have them. They have tops that squirt. 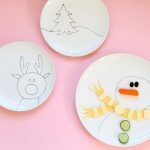 Did you have to “prep” your ornaments first? wash, rise…? Hi Danielle, I did not, and mine have been going strong for a few years, but it certainly wouldn’t hurt to swish some alcohol inside and let it dry. 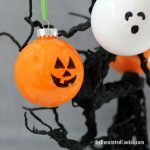 The one thing I wish I had done, and didn’t, was, after painting, overturning the ornaments (on a paper cup or egg carton) to let excess paint drip out. Ours have some little pools of paint in the bottoms that you can see if the light hits it right. CaN YOU USE PL;ASTIC ORNAMENTS? Hi Lisa, Absolutely! The clear plastic ones would work great. 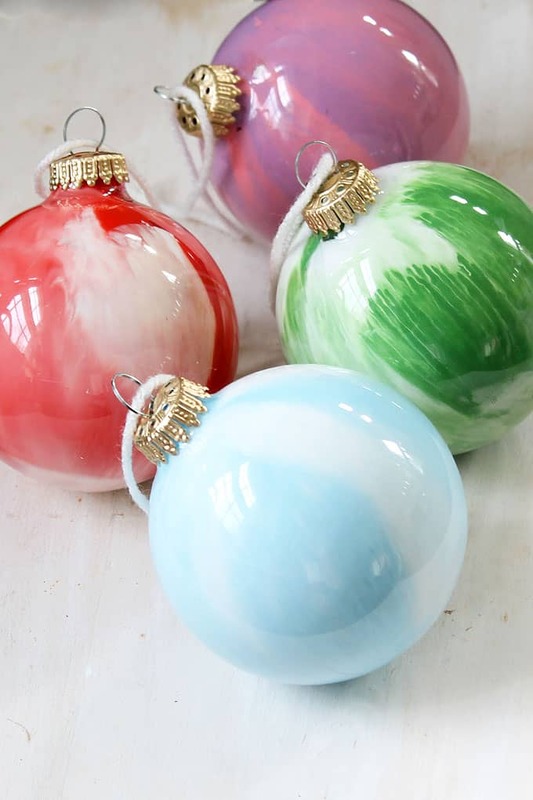 I made them but when I let it hang out while it dried all the paint came off the ball n when I turned it upright it all went to the bottom.. what am I doing wrong.. please help..
Hmm, was the paint crumbly? Were you using craft acrylics? And were the paints past expiration? I’m not sure what could have caused it other than the paint itself. I think it should work! Definitely worth a try, and I think if there’s enough in there it will still stick to the ball. My acrylic paint is think could I add some paint thinner to make it easier to swirl around in the ball?